Intel has been getting a lot of heat for failing to get yields up to the point where they could ship 10nm in volume. We have seen analysts talk about how Intel is now behind TSMC / GlobalFoundries / Samsung due to the fact that the latter plan to roll out their 7nm nodes in the 2nd half of 2018, while “Intel will still be at 10nm by 2019”. The problem with all this of course, is the assumption that the commercial nomenclature of these processes means anything – spoiler: it does not. Barclays recently downgraded NASDAQ:INTC causing shares to tumble citing issues with yields and the company losing its process lead. 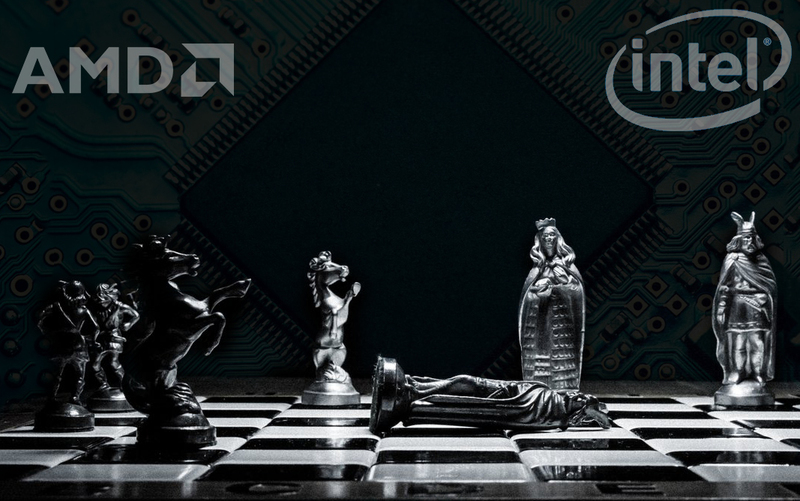 The analyst cited the fact that Intel will be rolling out its 10nm process in the second half of 2019 while AMD will already be on 7nm by the end of the year. He further stated that Intel is confident the company can maintain a performance advantage but has given no evidence to demonstrate this. Both of these claims, I believe, are an oversimplification of the issue and border on factual inaccuracy. So without further ado, let’s get into the nitty-gritty of things. The first mistake that most of the mainstream media is making right now is comparing the processes on a nomenclature basis. Comparing Intel’s 10nm to Samsung 10nm for example or assuming TSMC 7nm is further ahead of Intel’s 10nm is a mistake. The reason is simple, companies can name these processes whatever they want. They can name a 22nm BEOL process 22, 14, 12 or even 7. There really is no standardization to this so you have to look under the hood to get a good idea which nodes are comparable and which aren’t. 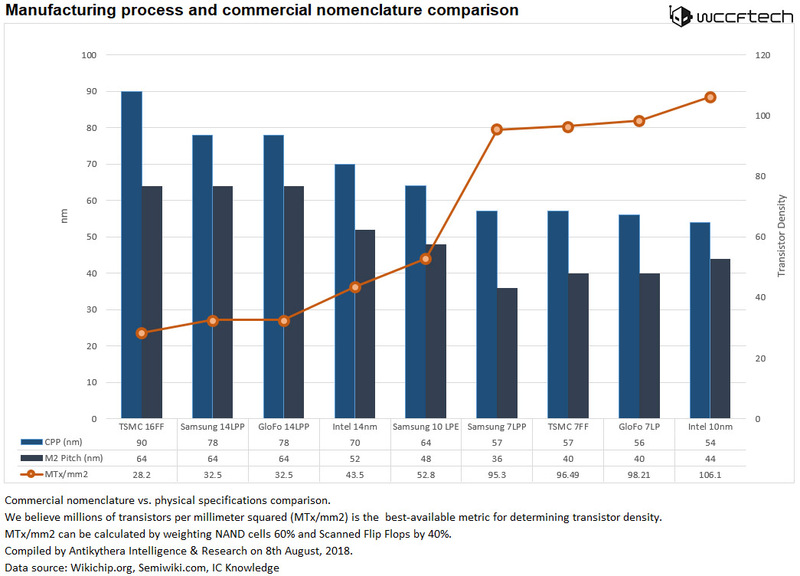 The Intel 10nm process on average is comparable to the 7nm variants of pure-play foundries. It is not for example even remotely comparable to TSMC 12nm (which is basically just an advanced version of 16FF) or the Samsung 10nm process. The correct way to look at it is to see how small the transistors are. Contact poly pitch and Metal Layer 2 usually are the best indicators of how scaling is happening and looking at millions of transistors per mm2 gives us the actual density increase of the process. Now here’s the funny thing, Intel’s 10nm process is actually more dense than all Pureplay foundries’ 10nm as it stands right now. Naturally, until we have the volume chip in hand there is no way to know for certain, but these are the best estimations we have (keep in mind these have already been adjusted for unrealistic claims by Intel). At an MTx/mm2 density of 106.1, the Intel 10nm process is superior to TSMC, GlobalFoundries and Samsung’s 7nm process. Just because its called 10nm (it could be called One-Eyed Peter’s Fabolous Process for all the naming matters) and that other foundries would have something called 7nm out soon doesn’t mean Intel is behind in actual fact. Intel’s 10nm will compete with 7nm from pure-play foundries. Intel’s 10nm hasn’t ramped to volume yet and expects to do so by 2H 2019. TSMC’s 7nm (high performance) isn’t out yet and 12nm is not comparable to Intel’s 10nm. Samsung 7nm (high performance) isn’t out yet and its 10nm process is not comparable to Intel’s 10nm. GlobalFoundries 7nm isn’t out yet and its 10 (Edit: Typo) new 12 nm process is not comparable to Intel’s 10nm. So what’s causing the delay in the first place and what does Intel plan to do about it? That said, all advisories are usually forward-looking, so even though Intel is in the lead right now, the company will lose this lead if TSMC actually rolls out their 7nm process on time – at least temporarily. Before we go any further, let’s try to figure out why the problem happened in the first place. Our sources tell us it had to do primarily with Intel overextending too early. SAQP or Self Aligning Quad Patterning is the technique the company used to make its 10nm process and it was the first in the industry to attempt to do so. The only problem is, it appears to have had unforeseen issues and was probably a mistake to shift to. The only reason Intel would take this long to ramp up to volume is if they were redesigning the process completely. In other words, the 10nm processors you saw on the market from Intel would have a different process to the ones that actually roll out in 2H 2019. A redesign could entail a lot of things but we have heard rumors that the company is planning to reduce the metal pitch to a level where SAQP would not be required (a sort of Intel 12nm process if you will). If that is the case then we will see the company lose its precious lead (but not fall behind) and have process tech that is about par with the rest. Of course, all that assumes that pureplay foundries like TSMC, GlobalFoundries, and Samsung do not run into the same issue as Intel since they will be utilizing SAQP as well. There is one major difference between their approach and Intel’s. Here is where things get even more complicated, TSMC’s 7nm and 7nm+ should be very different processes in terms of yields. The former will be manufactured using UV (and prone to run into the same issue as Intel) while the latter will be using EUV which requires more time to implement but should have more certain results overall. So why can’t Intel do the same and use EUV? well, they will. Intel has already invested a lot in Fab 42 in Arizona and it is almost certain that they will be utilizing EUV scanners there. Since yield issues aren’t contagious between process generations, we can expect Intel’s 7nm to be on track for the originally stated date. Remember, the use of SAQP was one of the issues so shifting to EUV (which means they would no longer require quad patterning to achieve the 10nm specs) should make it possible for the company to go ahead with 7nm just fine. Intel’s 10nm ran into issues due to the use of SAQP using standard lithography. Use of EUV could have avoided that. Intel 7nm will be based out of Fab 42 and should not be affected by the 10nm delay. TSMC is using SAQP for the basic 7nm process as well. Assuming they are able to avoid the issues Intel ran into and roll out on time, we expect Intel to temporarily be at-par with pure-play foundries before 7nm kicks in and they regain their lead. The real delay indicator to look for is the 7nm roadmap. Verdict: What we have tried to establish in this article is that it’s too early to call Intel’s process lead demise until 1) TSMC actually rolls out their 7nm process without delay and 2) we have confirmation of their 7nm EUV node being delayed as well. Without both of these scenarios happening we are either looking at a temporary lead loss lasting a year or so before 7nm kicks in and re-gains lead or absolutely no change at all.